Try to use Intel Joule with hundreds of sensors and modules. This will be a really good choice. Jumper cap for switching voltage All the red pin named "VCC" on this board will affect. ADC chip: ADS1115 Two ADS1115 carry 8 analog pins altogether and they are connected on I2C Bus 0. Also see "Analog Read Demo" below. NOTE: Other pins's function on Joule, you can check them here. 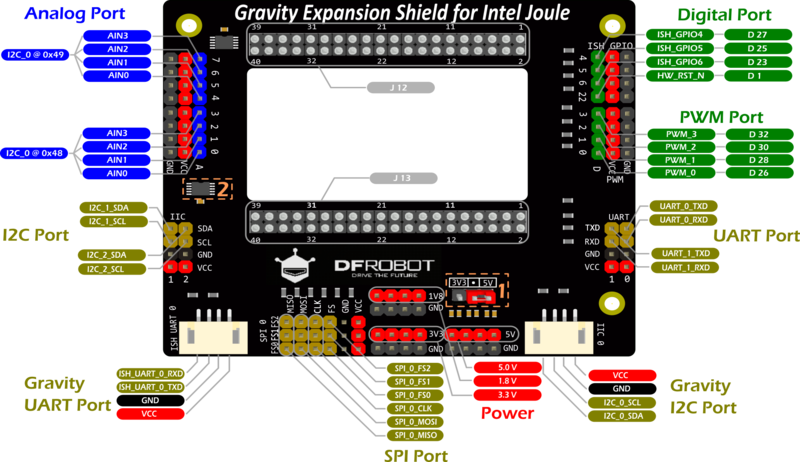 In this section you will create your first project with Intel Joule -- Blink a LED. Please follow the <Intel® Joule Module User Guide> for the setup steps. It is a deprecated and detailed guide by Intel. NOTE: This Demo prefers "Reference Linux* OS for IoT" instead of Ubuntu or Windows 10 IOT. You can keep your OS updated via this tutorial. 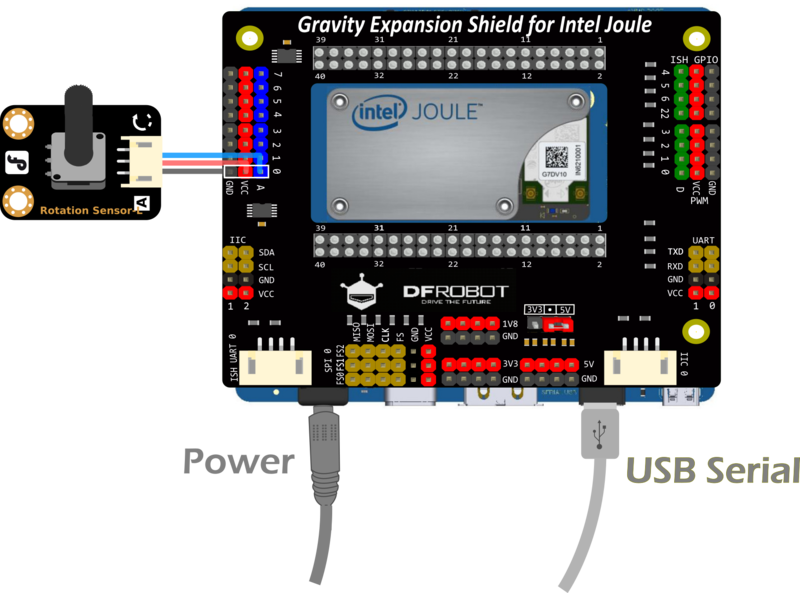 Plug Gravity Expansion Shield onto Intel Joule board. Connect usb serial port to your computer. 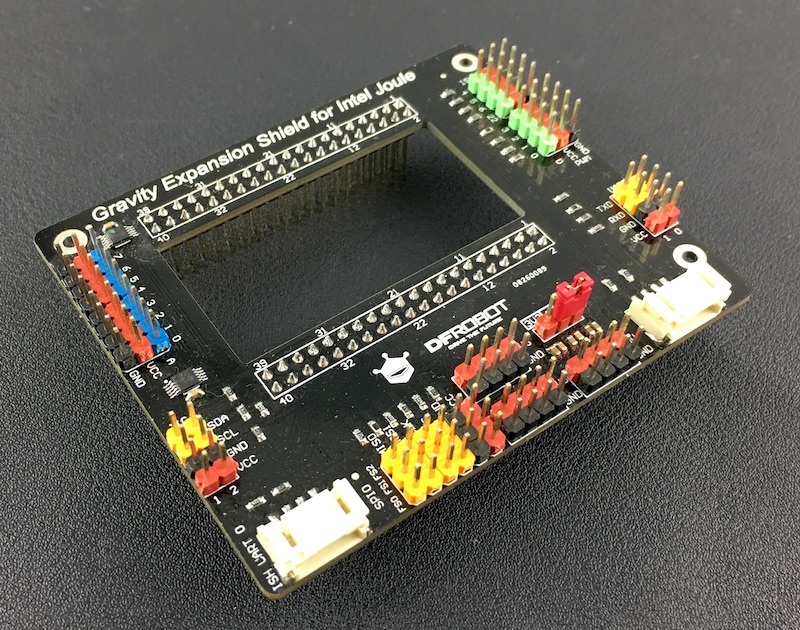 Find the "Gravity:Digital RED LED Light Module" in the "Gravity Sensor kit for Intel Joule" and connect to GPIO pin 4 as the hardware connection showed above. There is a known software issue in MRAA which prevents GPIO working properly. We reported it to Intel and they solved it quickly. However, it will not be released until fully tested. Although It is a better idea to wait for the the fully tested version, if you are willing to have a try, you can get here and update the latest version. Login your Joule via Putty or other serial tools. Create a Node JS example using vi. NOTE: Tip to get the right pin number: For example: GPIO Pin 4 on board >> ISH_GPIO4 >> D 27, so the pin number in the code should be 27. Please check the Board Overview for other pins. Run the node sample in the bash. The LED starts to blink. to stop running the demo. You have done the first project on Intel Joule. Well Done! In this section, you will know how to use the onboard ADS1115. For this demo, we assume that you have successfully finished the blink demo above. 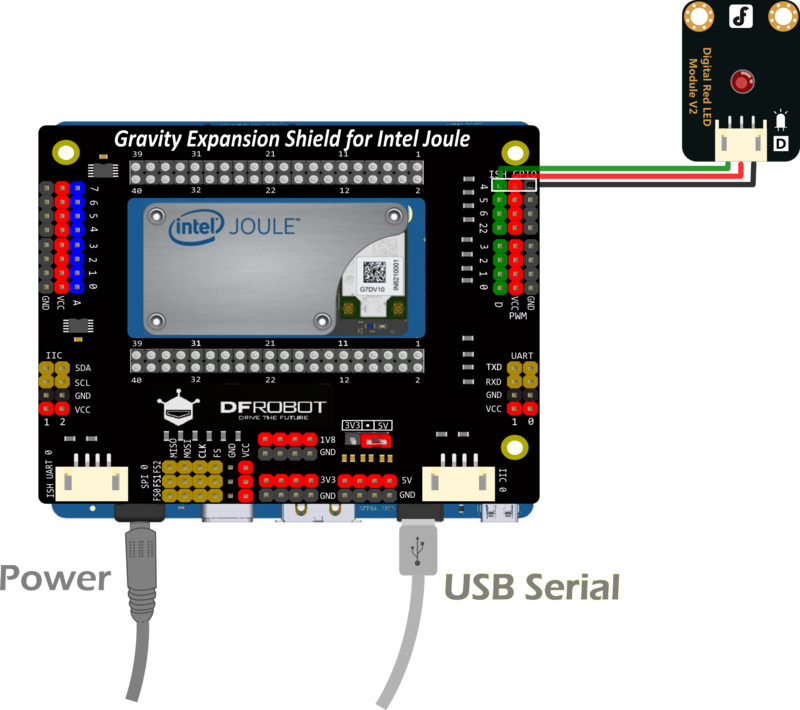 Find the "Gravity:Analog Rotation Potentiometer Sensor V1 For Arduino" module in the "Gravity Sensor kit for Intel Joule" and connect to Analog pin 0 as the hardware connection showed above. Run the following code to get the analog result. This Demo read the digital onboard GPIO pin 4 . we assume that you have successfully finished the demos above. This Demo set the PWM value onboard PWM pin 3 . we assume that you have successfully finished the demos above. This Demo control the Servo through PWM pin 0 . we assume that you have successfully finished the demos above. pwm.write(processedValue); //Write duty cycle value. Or you can take a look at the examples of mraa.